The winery Pazo San Mauro, located in the Denominación de Origen Rias Baixas, was acquired in 2003 by the Grupo Vinícola Marqués de Vargas. Since then, the new owners have invested heavily in both the restoration of its magnificent buildings and the construction of a new wine cellar, with the most advanced technologies for the finest production of wine.In this winery two white wines from the albariño grape are produced and all grapes are grown on the estate owned vineyards. The Pazo that overlooks the property that is located in the parish of San Pablo de Porto belongs to the town of Salvaterra do Miño. Built in 1591, shortly after the chapel that was erected in 1582 in honour of San Mauro, or San Amaro, the Pazo was the main dwelling of Pereira do Castro, descendent of Sancho I of Portugal. Two magnificent family coat of arms hang in the chapel to attest to the history of the family.Vine cultivation has always been intimately linked to the history of the Pazo. Remains of an old winepress can be found in the building, proving that wine was already being made in the Pazo in the XVI century.The first modern Bodega was built in 1988, when the PAZO SAN MAURO winery was established. The 30-hectare estate is situated in a privileged location for the cultivation of the grapevine attributable to optimal soil conditions, an exceptional microclimate, midday sunlight exposure and protection from northern winds. The Condado do Tea, where the winery is located, is the most southern area and therefore the sunniest.Because of this, a more complete and early maturity is achieved here, where harvesting can be carried out 15 to 20 days earlier and the required degree of alcohol can be guaranteed.The vines are planted in descending terraces towards the Miño River, creating a natural amphitheatre facing south, bathed in extraordinary sunlight.The river stones on the hillsides and the alluvium soil on the riverbanks allow for the optimal cultivation of the different varieties of the vine. 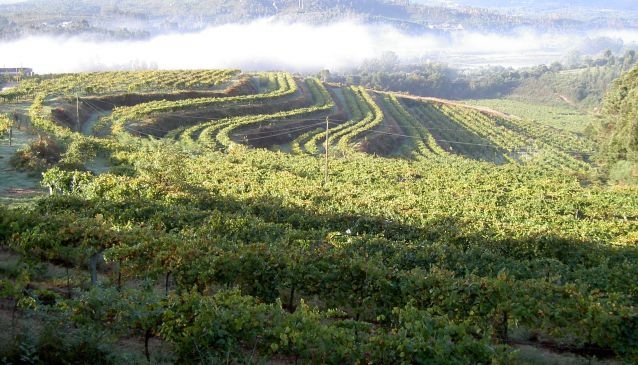 Although the majority of the vines are of the Albariño variety, there are plantations of other varieties, such as Loureiro, Treixadura and Torrontés.The grapes are grown on trellises in restricted production and are exposed to the optimal ventilation, resulting in the highest quality fruit. The average vine age is 30 years. During the harvest, a rigorous selection of grapes exclusively from our estate vineyards takes place. They are hand picked in 20 Kg boxes.Once harvested, the stalks are removed and a cold maceration is carried out during which time the skins are in contact with the must for several hours in order to extract the highest degree of aromas.This is followed by a fermentation of 15 days in stainless steel tanks at 17-18ºC. One of the wines produced in the winery (Sanamaro) is put through a process of 'sur lie' and 'battonage', in which the lees are in contact with the wine for several months in stainless steel tanks. The result is a more complex wine with an oily texture. The Group has made significant investments in the installation of the most technologically advanced equipment to further improve the quality of its wines. Albariño Pazo San Mauro 2009 is a monovarietal wine, resulting from a meticulous selection of the best grapes on the property, all from estate-owned vineyards. The vineyard is situated in a privileged location in the Condado do Tea, on rolling banks of the river Miño that create a natural amphitheatre, bathed in extraordinary sunlight during the midday hours. Grapes planted on trellises so that the fruit, in very restricted production, grow in optimum wind conditions, reaching their peak quality.Brilliant pale yellow with greenish hues. Complex aroma, revealing an intense varietal personality: ripe apple, peach, citrus and hints of floral, the Albariño grape in all its splendour. On the tongue, markedly fruity, flavourful, abundant and fresh. Very well balanced and a long floral finish.Sanamaro albariño is also now available too.